Like many places in the Crescent City, Brennan’s is haunted. Unlike most haunted sites in the city, however, the restaurant isn’t haunted only by angry, vengeful, or tragic ghouls. In addition to at least one creepy spirit, peaceful, helpful presences also call the restaurant home. Across its three centuries of life, New Orleans has enjoyed several cultural identities. Mainly, though, the city has been associated with the French and the Spanish. Perhaps because of this association, Owen Edward Brennan, the patriarch of the Brennan family, was mocked for his Irish heritage. Count Arnaud, a New Orleans restaurateur, once told Brennan that “an Irishman’s culinary skills end with boiled potatoes.” Brennan knew he had to prove Arnaud and that stereotype wrong. In 1946, he did just that. He opened Owen Brennan’s Vieux Carre Restaurant on Bourbon Street. Brennan’s Vieux Carre Restaurant was where the famous New Orleans dessert Bananas Foster was invented by Chef Paul Blangé. Another local tradition started at this restaurant was Breakfast at Brennan’s, which showcases one of the largest breakfast menus in the city. Following Owen Brennan’s passing, in 1956, the restaurant moved to its present location on Royal Street. The pink building on Royal was constructed in 1795 by Vincent Rillieux, grandfather of renowned artist Edgar Degas. The building has also been the site of the Louisiana State Bank and a home to President Andrew Jackson. In 2013, the building underwent a major restoration, unearthing, among other things, a hidden door. The Irish-American Brennan family has established a number of respected New Orleans restaurants. In total, the extended Brennan family operates 10 restaurants in New Orleans, with 7 in or near the French Quarter. By the 1970s, the Brennans owned Commander’s Palace, another beloved Big Easy dining institution. Remarkably, noted New Orleans cuisine Chefs Emeril Lagasse and Paul Prudhomme’s careers both took off from their times spent at Commander’s Palace. Other restaurants under the Brennans’ ownership include Ralph’s on the Park, Café NOMA in the New Orleans Museum of Art, and Napoleon House, all in or near New Orleans. During his career at Brennan’s, Chef Paul Blangé shaped the restaurant’s menus. His most notable contribution was the dessert Bananas Foster, named after Richard Foster, a friend of Owen Brennan’s. Blangé created the dish in 1951, and it remains the most-ordered item at the restaurant to this day. The original Bananas Foster has also inspired a host of other versions of the dessert, including pastries, candies, and drinks. 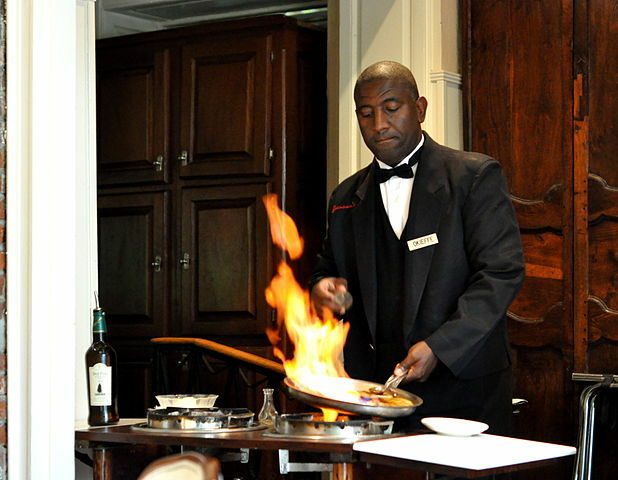 Bananas Foster being prepared (flambéed) tableside at Brennan’s. Photo source. Chef Blangé’s culinary creativity and devotion made him an admired chef. The chef was dedicated to his work to the very end—after his death, he was even buried with a Brennan’s menu, knife, and fork across his chest. According to Food + Wine, Blangé’s loyalty extends beyond his death. Restaurant staff says the chef “never leaves” the kitchen, despite his death in 1977. Every night, Blangé’s ghost signals the end of the night shift by banging pots and pans in an almost celebratory manner. This nightly noise is unlikely to be the work of a prankster in the kitchen, as the sound is heard while the restaurant’s doors are being locked from the outside. For those seeking to spot the chef’s ghost, he can sometimes be seen in the dining rooms or by the front door. Your best chance at summoning him, however, is by ordering Bananas Foster, his signature dish. While the bananas are aflame at your table, look around for the chef’s translucent ghost. His ghost sometimes appears in other forms, like a brief sparkle, or a heat-wave-like distortion of a man in a chef’s hat. Chef Blangé is not the only eternally faithful member of Brennan’s staff. In his life, Herman Funk was a sommelier who helped form the restaurant’s extraordinary selection of wine and spirits. Now, Funk lives on in the wine cellar. His ghost helps the waitstaff decide on wine suggestions and pairings. To indicate his picks, Funk’s ghost “clinks” his preferred bottles. It is common for spirits to linger in places that important to them in their lives. Unfortunately, this importance is all too often because of abuse, trauma, or tragedy that once occurred in those places. For the ghosts of Paul Blangé and Herman Funk to be so friendly, and continue to, in their own way, “work” at Brennan’s, the restaurant must truly be special to them. Unlike the upbeat gourmand-ghosts of the kitchen and wine cellar, Brennan’s has been home to at least one more traditional specter. This spirit has dwelled in the Red Room. The Red Room is undoubtedly the darkest and most haunted part of Brennan’s. Its blood-red walls saw much horror. According to 18th century legend, one fateful morning, Monsieur LeFleur calmly planned three funerals. Later that day, he came home. He killed his wife and son. He then killed himself by hanging himself from the chandelier in the center of the Red Room. Prior to the restaurant’s 2013-2014 renovations, painted portraits of the LeFleurs were on the room’s walls. This room was the site of eerie phenomena. For instance, no matter the time of day or the weather conditions outside, restaurant guests could feel a “cold spot” over the fireplace with their bare hands. The cold spot didn’t just feel chilly, but as cold as reaching into a freezer. On the walls, the portrait of Monsieur LeFleur appeared to change its expression. You could look away from the portrait one moment, and look back the next to see a slightly different expression. Namely, LeFleur’s smile shifted to a grimace. The ghost of Monsieur LeFleur has also been witnessed, per investigator Broome again, as a “shadowy figure, about five and half [sic] feet tall and somewhat portly.” The ghost disappeared whenever direct eye contact was made. After the restaurant’s renovations, the second-floor dining room seems to have been changed significantly. It is apparently now known as the Morphy Room, in honor of chess prodigy Paul Morphy, a former resident of the property. The former Red Room seems to have been broken up into a small parlor and dining area, as opposed to the larger dining room it used to be. The room has also been redecorated. Noticeably, Monsieur LeFleur’s portrait has been moved from its former position directly above the fireplace. LeFleur’s portrait was replaced with a portrait of Paul Morphy. A fireplace and chandelier are still present. Whether or not the Morphy Room’s fireplace and chandelier are the same as before is unclear. However, it is entirely possible that, even though their appearances superficially changed, the fireplace and chandelier are still the same. As such, they likely carry the same paranormally-charged energy. Perhaps the redecoration of the Red Room was to update the room for a more modern look. Or perhaps the owners of Brennan’s were trying to drive out LeFleur’s unsettling spirit. Moving the portrait, refinishing the fireplace, covering the walls… these design choices coincide with the most paranormally active parts of the room. It is presently unknown if LeFleur’s ghost still actively haunts the restaurant, but usually, the stronger a spirit was in its convictions in its life, the stronger that spirit is after death. Given the atrocity that LeFleur was able to commit against his own family, it is quite likely that his spirit persists in Brennan’s despite the renovations. Brennan’s reputation as both an esteemed and haunted restaurant precedes it. On the culinary side, the restaurant is considered one of the best in New Orleans, and a must-try for visitors. On the paranormal side, Brennan’s ghoulish reputation is well-known. It was even featured on an episode of the television series Ghost Hunters. 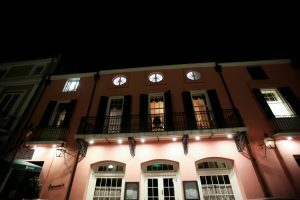 If you’d like to learn more about the ghostly side of the restaurant and see it for yourself, consider joining us on our New Orleans Ghosts Tour. We take you through the French Quarter on an immersive, thorough walking tour of the most haunted locations in New Orleans. Our extended tour includes Brennan’s. Following the tour, you are welcome to go inside Brennan’s to investigate the mystery of the LeFleur haunting, or simply enjoy a snack, drink, or meal. We suggest the Bananas Foster. Our New Orleans Ghosts Tours meet nightly. For more information, please click here. Allen, Kasy. “Brennan’s Restaurant: Haunted Restaurants | Back Burner.” Backburner Blog by ETundra.com, eTundra, 20 June 2017, blog.etundra.com/in-the-restaurant/brennans-restaurant-haunted-restaurants-nope/. “America’s Haunted Restaurants and Hotels.” Food & Wine, Meredith Corporation Allrecipes Food Group, www.foodandwine.com/slideshows/americas-haunted-restaurants-and-hotels#4. Brennan’s New Orleans. “Bananas Foster | Brennan’s Restaurant : A New Orleans Tradition Since 1946.” Brennan’s Restaurant : A New Orleans Tradition Since 1946 : French Quarter Restaurant, Ralph Brennan Restaurant Group, www.brennansneworleans.com/recipes/bananas-foster/. —. “Morphy Room | Brennan’s Restaurant : A New Orleans Tradition Since 1946.” Brennan’s Restaurant : A New Orleans Tradition Since 1946 : French Quarter Restaurant, Ralph Brennan Restaurant Group, www.brennansneworleans.com/morphy-room/. —. “Traditions | Brennan’s Restaurant : A New Orleans Tradition Since 1946.” Brennan’s Restaurant : A New Orleans Tradition Since 1946 : French Quarter Restaurant, Ralph Brennan Restaurant Group, www.brennansneworleans.com/traditions/. Broome, Fiona. “Boogeymen At Brennan’s.” Alan’s Mysterious World, 21 Sept. 2011, alansmysteriousworld.wordpress.com/2011/09/21/boogeymen-at-brennans/. —. “Brennan’s Red Room Ghosts – New Orleans.” Hollow Hill, 30 July 2005, hollowhill.com/brennans-red-room-ghosts-new-orleans/. “”Ghost Hunters” New Orleans, LA: Brennan’s Restaurant and a Private Home (TV Episode 2005).” IMDb, 10 Aug. 2005, www.imdb.com/title/tt0911715/. McNulty, Ian. “The Brennan Family Of New Orleans | A Luscious Legacy.” French Quarter New Orleans Events, Hotels, Restaurants, Shopping & Sightseeing, FrenchQuarter.com, www.frenchquarter.com/brennan-family-legacy/. “Restaurants :.” Ralph Brennan Restaurant Group, www.neworleans-food.com/restaurants/.